Cruising around Santorini, swimming and snorkeling in unique places and enjoying a meal and a glass of wine onboard will probably be a highlight of your vacations! You don’t have to own or rent a boat to live it, just join a tour, relax and let others cater for everything. You can choose a sailing boat, a catamaran or a larger motor boat, according to your preferences. You also have the option of private tours, for a more romantic experience. Depending on the schedule, cruises include visits in Nea Kameni and swimming in Hot Springs, White and Red beaches. If you choose the sunset cruise, you will have the opportunity to enjoy magnificent views as the sun goes down to the sea. The usual duration of this kind of tours is 4-5 hours. Below is a list with our favorite ones. This evening dinner cruise gives you the opportunity to delight in the views of Santorini’s caldera and sunset. You board a comfortable boat and soak in the scenery as you sail across the caldera to some of its most-admired beauty spots. Savor a buffet dinner on board, and finish by watching a famous Santorini sunset from the water. Experience the magic of Santorini with a half-day or sunset relaxing 5-hour sailing trip on a Tahiti 80 catamaran. Enjoy the sea breezes and scenery as you sail around the caldera. 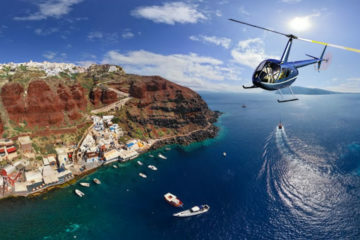 Drop anchor to bathe in the hot springs and Saint Efta Pedes cave, snap photos of Santorini’s sparkling white clifftop villages, and swim and snorkel off Therasia. Enjoy a barbecue lunch onboard, including Greek specialties while you drink unlimited soft drinks and wine. Experience beautiful Santorini in the best way, during daytime or during the sunset, with this 5-hour catamaran cruise. Enjoy a Greek barbecue onboard with unlimited wine, soft drinks and water. Experience Santorini’s scenery, hot springs and beaches on a 4-hour cruise, with an onboard dinner and glass of wine included. Sail around the caldera and island’s shores, swim in the Nea Kamini springs, explore the beaches and savor a 2-course Greek dinner while floating on the water as the sun sets. Swim, snorkel and sunbath around Santorini on this 5-hour cruise. Along the way, see landmarks such as Indian Head Mountain and the Old Venetian Lighthouse; visit the Red and White Beaches and take a dip in the Hot Springs. Enjoy a BBQ lunch with Greek specialties on-board and drink a glass of wine as you lounge on deck. Explore the beaches, bays, and islands around Santorini on this catamaran cruise. Swim and snorkel at the Red and White Beaches; take a dip in the volcanic hot springs and tuck into a BBQ lunch on-board. Enjoy a chilled-out daytime cruise on the waters of Santorini or relax in style as you cruise around Santorini’s shores at sunset on this 5-hour, small-group (up to 16 people), catamaran trip. Settle aboard the spacious Lagoon 500 catamaran, sail on the caldera, by Indian Rock and Akrotiri Lighthouse, stop to swim and snorkel at Red Beach and White Beach, and bathe in hot volcanic springs. You can use the complimentary snorkeling equipment and towels and enjoy the onboard barbecue meal with unlimited white wine, ouzo, sodas, and water. Spend the day relaxing, swimming, snorkeling and visiting the well-known Santorini’s landmarks like the White Beach, Red Beach and volcanic hot springs on a 5-hour, small group (up to 22 people), sailing sightseeing excursion. For a unique experience go for the afternoon cruise and watch the famous sunset of Santorini from the deck of the Lagoon 560 luxury catamaran, just below the clifftop village of Oia with a cool drink in hand. Savor a traditional Greek barbecue and unlimited drinks served onboard. 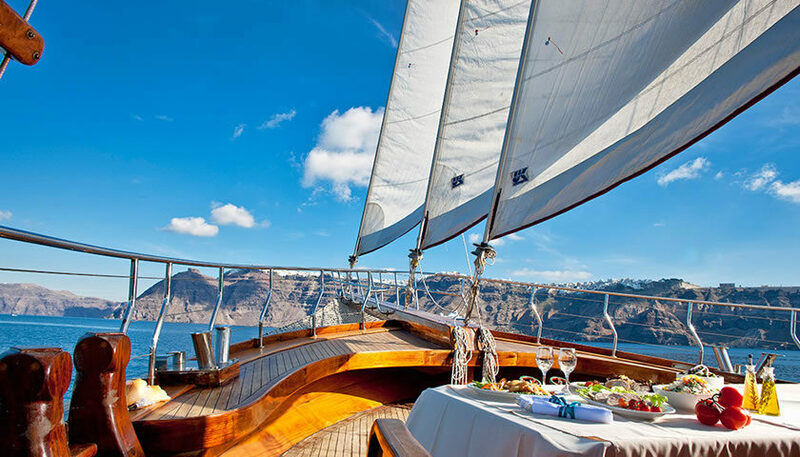 Sail around Santorini on either a Day Tour or Sunset Tour. During this 5-hour excursion, you’ll see some of the island’s highlights and landmarks from your vantage point and take a dip in the local hot springs. Go snorkeling and follow it up with a barbecue meal and Greek wine. Experience Santorini’s beauty, hot springs and beaches on a 5-hour catamaran cruise. You can select between a daytime or sunset cruise, and sail around the island and caldera on a deluxe catamaran. Stop to Nea Kameni hot springs; swim, snorkel or unwind at beaches. Enjoy Santorini wine and Greek beer, plus a Greek meal prepared on board. On the evening cruise, be treated to awe-inspiring sunset views. Numbers limited to 16, this offers a small-group experience. If you are a group of people or you prefer privacy, a flexible itinerary and you care less about the cost, you can book a private daytime or sunset cruise. In this case the price varies between 900€ for a 6-people, half-day cruise, to 3600€ or more for a 15-people, full-day cruise. A shortlist of selected private tours can be found below. Sail around Santorini on a private catamaran cruise. Choose between a daytime or sunset cruise and spend half a day lazing on deck of a luxury catamaran, soaking up the sun, sights and sea views. Dock by Red Beach and White Beach for swimming, snorkeling and sunbathing, and bathe in waters of the natural volcanic hot springs. If you’ve opted for the sunset cruise, be sure to bring your camera to capture the world-famous sunset for which Santorini is famed. A traditional meal and unlimited wine, beer and soda are included. From 1 to 9 people. Price: from €181,25 per person (for group of 8 people). Experience Santorini with this 5-hour catamaran charter. You can follow your captain’s advice and visit the Indian Rock, the Red and White beaches and the volcano hot springs, or build your itinerary to suit your interests. Enjoy a full barbecue lunch and unlimited drinks onboard. From 1 to 4 people. Price: from €250 per person (for group of 4 people). A tailor-made private, 5-hour cruise to enjoy swimming and snorkeling, soak in the hot springs and admire landmarks such as the Light House, Indian Rock and Akrotiri. A barbecue lunch and unlimited drinks are served onboard. From 1 to 12 people. Price: from €115 per person (for group of 12 people). A 5-hour excursion with your own private catamaran. Spend the day swimming, snorkeling, sunbathing and exploring Santorini’s most secluded beaches. You’ll also soak in a volcanic hot spring, and enjoy a barbecue meal with wine, beer and soft drinks. From 1 to 15 people. Daytime or Sunset: from €120 per person (for group of 15 people). Fullday: from €240 per person (for group of 15 people).